1 Haider Ackermann : Source. 2 Giles : Source. 3 Hussein Chalayan : Source. 1/2 Mango. 3 Norma Kamali. 4 JCrew. 5 Jil Sander. 6 ALC. 7 Burberry. 8 JCrew. 9 BCBG. 10 Alexander McQueen. 11 Valentino. 12 Chloé. The striking look of crisp white on white may be a huge trend right now but let's face it this look will never go out of style. With labour day weekend in effect I thought it would only be appropriate to squeeze in the white trend before it's no longer acceptable to wear it again until next Spring - ya right! Who made up that silly rule anyway? It's surely not one I follow! Anyway I guess there are two ways I would wear white on white. First, if you are going to an event where you are looking to stand out there is nothing more classic that sticking to complete whites. That's right head to toe. With this rule I would like to make the exception that above in Carolina from Fashion Squads example, I love that her clutch does include a very pale grey that doesn't distract in the least bit from her all white look. 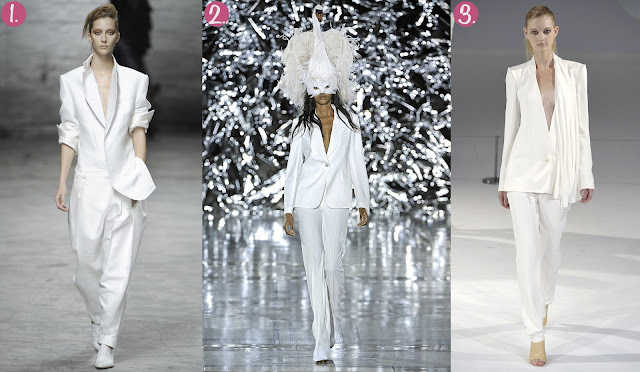 Secondly, if you are wearing white on white just for a casual to semi-dressy look please do add bits of colour. I know bright colours have been fun to play with this season but I would lean toward incorporating pastels to finish off your outfit. Combining creams with blush, light blues or greens and silver accents will turn your outfit into playful chic. White is probably my absolute favourite colour to wear. Great post! I love this trend! Great tips! Great tips, I have a white blazer learning the hard way how to care for it lol. Following you! Great post! Thanx for sharing the inspiration!! This is great! 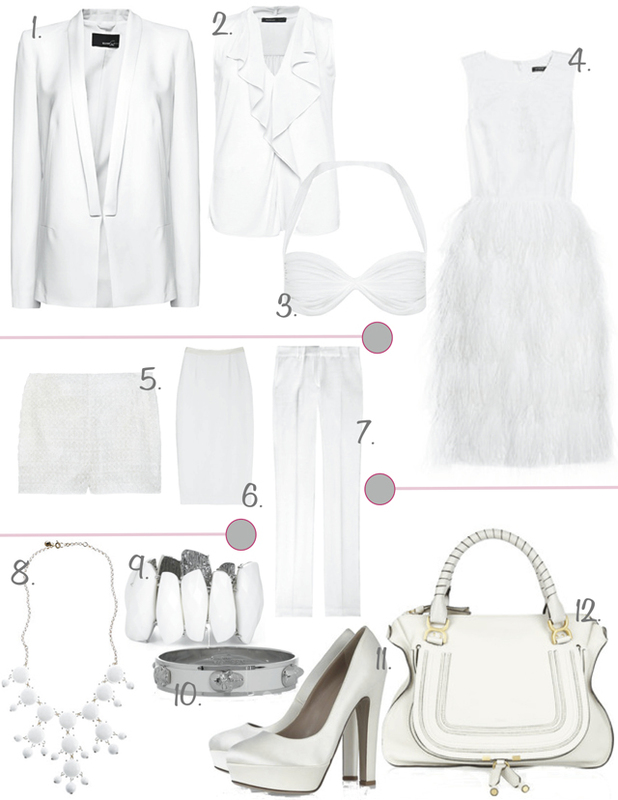 white on white is one of my favorite trends too and it should be totally acceptable to wear after Labour Day. Amazing blog, dear! You have a new follower!)) Hope you'll do the same! white is like black-it goes always! I love white! Great items! I see eye to eye with you here, I love whites! and what great picture selection, you did a great job!! What a perfect white inspiration for Labor Day...thanks for sharing!! surfing around your blog posts. After all I'll be subscribing to your feed and I hope you write again very soon!